There are two different types of people in this world - those who solve their problems with creativity and inventiveness, and those that punch their problems in the face. This robot falls into the latter category. It's the invention of a startup called Deepfield Robotics under the auspices of engineering giant Bosch, and offers "Vision-Based High-Speed Manipulation for Robotic Ultra-Precise Weed Control". Translated, that means it looks for weeds in the ground and smashes them below the surface so they can't grow. Right now, the scale of global agriculture means that weeding by hand is impossible. Instead, we use vehicles or aircraft to spray chemicals that impede the growth of weeds, known as herbicides. The problem with that strategy is that the chemicals then get washed into the soil and have all kinds of unexpected and adverse effects on the environment. Deepfield Robotics' robot takes a different approach. It trundles through a field until it spots a weed (from the shape of its leaves), then uses a one-centimetre wide pillar of metal to ram it about three centimetres below the surface. That kills smaller weeds outright, and larger ones can be pounded repeatedly until they submit. 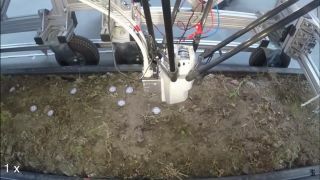 In tests on a real carrot crop, it was capable of handling 1.75 weeds per second at a density of 43 weeds per metre, while its on-board power source lets it run autonomously for 24 hours before needing to refuel. More real-world tests are being carried out now, so expect to see one pretty soon on an autonomous farm near you.